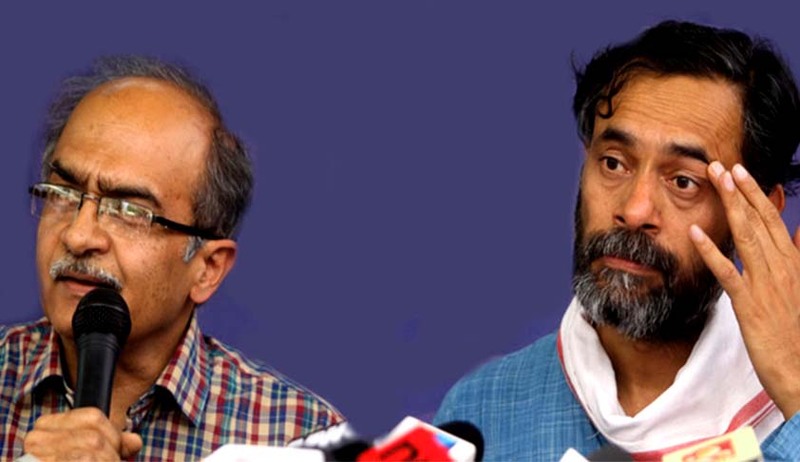 The hearing in the case of Swaraj Abhiyan v Union of India concluded today in the Supreme Court with the bench comprising Justices Madan B Lokur and NV Ramana reserving its judgment. Over the last four moths, the Court held 15 hearings, lasting nearly 40 hours, in this case. Swaraj Abhiyan leader Yogendra Yadav was present in the hearing throughout, and made significant submissions himself. Appearing for the petitioners, Prashant Bhushan provided evidence that the figure of 33 crore persons affected by drought as offered by the Central government was erroneous. If we go by the drought notifications issued by 11 states so far, at least 43 crore people live in areas declared drought affected, he said. Today, Prashant Bhushan told the court that the Government of India does have a method for determining drought. If we go by the government's own Agricultural Drought Assessment Report issued by Mahalanobis National Crop Forecast Centre – which Prashant Bhushan claimed he came across only two days ago - then Bihar, Haryana and Gujarat should declare drought in many more districts. If we include these, the number of drought affected persons in the country is 54 crores, over two-fifth of the country's population, he told the court. In the course of the hearing today, the bench questioned the Central government on its implementation of some key statutory obligations. The Central government argued that it had done all it could for drought mitigation and that doing more was beyond its means. Narasimha said that the states were not under any legal compulsion to offer additional daal and edible oil in ration or milk or egg in the Mid-Day-Meal scheme as demanded by Swaraj Abhiyan. Narasimha claimed that the Centre and the States were working in tandem. “Every day, there is a video-conference on the issue”, he told the court. There is no need to infer that the States are reluctant to declare drought, because there are financial implications, he said. Questioning the Centre, Justice Lokur observed that drought should be described as a ‘threatening disaster’. The Central Government claimed that there was enough fodder for cattle and that all necessary steps had been taken to resolve drinking water shortage. In any case, the Central government claimed that drought relief and mitigation were the responsibilities of the state governments. Starting as a case for immediate drought relief, this case has grown into a judicial review of the state policy on rural distress and agrarian crisis. Besides some immediate relief and rationalisation of the drought declaration methods, Swaraj Abhiyan petition asked for upgrading crop loss compensation to the farmers and restructuring of farm loans on the same lines as restructuring of corporate loans. The Abhiyan has urged the court to appoint independent Commissioners to monitor the implementation of court orders, and to get ground-level reports. Prashant Bhushan expressed the apprehension that whatever order Court gives will not be implemented unless the Court monitors. He cited the Right to Food case as a precedent for this purpose. The Commissioners can appoint their own trusted people, he said. The Central Government has agreed in the court to increase the first instalment of MNREGA funds from Rs. 7000 crores to over Rs. 19,000 crores. In all, 10 state governments had to report their drought relief measures to the Court. Meanwhile, Swaraj Abhiyan has proposed to hold a National Consultation on Drought on 1 May in Delhi in collaboration with Inclusive Media for Change and Down to Earth.